post-war profiteering and anti-worker practices by employers and governments alike that continued such attacks from the pre-war and wartime periods, lay down tools and took to the streets en masse to demand a new economic system. 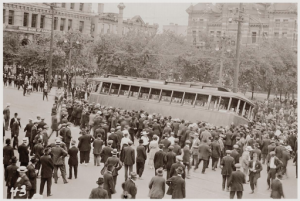 The Winnipeg General Strike was a response to the oppression faced by workers and soon workers in many places across the country, including Calgary and Edmonton and Alberta’s many coal towns had also initiated general strikes. The ALHI Calendar is more than a calendar. It is a readable and condensed but highly accurate history of trade unionism and workers’ struggles in Alberta. It is also the top source of income for ALHI as it goes about its work of doing oral histories of Alberta working people and documenting in various ways the struggles of working people to build unions and to fight for political, social, and economic democracy for the people of Alberta. purchasing and displaying these calendars which have proven to be an invaluable source of information about working people and their history.